In November 2008 I put forth a list of things I thought were the best Web sites, applications, and various other things that I came across in 2008. I said “They are simply works that I feel should be awarded with the recognition of being the best that Iâ€™ve personally found this year.” I’m doing the same this year, and including things not-so-technical also, so lets get started. This year’s pick for best blog did not come easy. 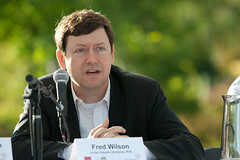 I’ve chosen Fred Wilson’s blog, A VC, for a number of reasons. First, he writes very often. In a post about his own tips for bloggers he says to write every single day and I believe he comes fairly close. But that isn’t what makes his blog great. Somehow, even though he manages to write nearly every single day, he consistently writes extremely open and revealing posts about the world of venture capital and business in general (with music and other personal interests thrown in for good measure). It isn’t the quality of the writing, per se, it is the quality of the insight. As someone who has been involved in a few strong startups I can say that somehow Fred manages to hit the nail on the head more often than not. Even when he misses (in my opinion) and hits his thumb – he somehow brings the post that he’s writing back into a realm where you can see his point and believe that he’s probably right and you’re probably wrong. It is an art that I have never mastered. If you are building your own company it is a must-subscribe. No question. The best podcast: Fresh Air with Terry Gross. I’ve gushed about Terry Gross so much this past year I’m sure you all think I’m hitting on her at this point. Maybe I am. But she deserves it. But the show isn’t just her. She must have a fairly good team behind-the-scenes that puts together her show each day and, ultimately, packages it for the podcast. I don’t listen to many audio or video podcasts on a regular basis but I have been subscribed to Fresh Air for a few years now and I don’t see myself unsubscribing any time soon. Letters of Note is pretty much the perfect blog. Blogs, unless they are personal journals, should focus on a very specific topic. You’ve probably noticed that the most popular blogs are focused on technology, gadgets, startup companies, knitting, cooking, design, etc. There are very few popular blogs that focus on many things while there are a ton that focus on one thing. Letters of Notes knows where it fits and focuses on a really fascinating topic; letters, notes, memos, and even telegrams that are in some way notable. I have yet to come across an uninteresting post at Letters of Note. Honorable mention in this category includes Liz Danzico’s Bobulate (which is a personal blog but one that could have easily won this award this year). I’m hopeful that the Panic blog makes this list next year. The best blog redesign: Pat Dryburgh. Online friend and fellow aspiring thin man Pat Dryburgh recently redesigned his Tumblr-powered Weblog and I think he did a fantastic job. Pat’s simple logo, as an example, is inspiring. The work section on his site is very well done (I like the bit where you can get to any work from any work). I’m not too keen on his heading weights but besides that I really, really appreciate a well designed personal Web site that feels, personal. More people (myself included) should have a Web site that oozes their personal brand. I believe last year’s winner, Jason Santa Maria, would agree with this year’s pick as well. Although my personal blog is still running well on WordPress I’ve been thoroughly impressed by what the Tumblr team has done this past year. They are continuously rolling out excellent features that help them both catch up to and surpass the competition. Where does Tumblr fit? I believe that Tumblr is the best choice for new bloggers while WordPress is still the better choice for those of us that like to get our hands dirty. If the Tumblr team keeps up their current pace, I could see that changing in 2010. On today’s Web new reading material comes from every direction like a barrage of arrows from an invading army. Accept that these arrows are tipped awesome words rather than steel dipped in poison. Twitter, Facebook, your favorite feed reader, your best friend via instant message, and even your mom via email. These are all new sources of great things to read. But this poses a problem. You didn’t have time to read before and you certainly don’t have time to read now. But, maybe, just maybe, you’ll find some time to read later. And that is where Instapaper comes in. Instapaper is comprised of a simple bookmarklet, a Web site, an iPhone application, and many other small pieces that are loosely joined together to give you a place to keep a stream of things you’d like to read later. Then, when you’ve found the time, you can read them. Wherever you’d like to. When you want to. On your iPhone, Kindle, computer… anywhere. Awesome. In November I described it as drugs without the side effects. Use it. Abuse it. Become an addict. The best mobile Twitter client: Tweetie 2. My pick for best mobile Twitter client is consciously nearsighted, being that I’m an iPhone user and haven’t played much with other mobile platforms, but I’m fairly certain that my pick is still the best. You probably thought that I was going to say Hahlo. Last year I did. And this year Hahlo has seen some incredible updates, with 4.1 being released just this week, and I still think it is absolutely fantastic. But, Tweetie 2 steals the crown for a few simple reasons. On my original iPhone (yes, I still have an original day one iPhone) Hahlo can not perform nearly as well as Tweetie. To no fault of its own. As John Gruber recently covered, in his usual thorough manner, iPhone web applications simply can not perform as well as native applications due to drawbacks within Webkit. Tweetie 2 for iPhone is brilliant. The best book: Cesar’s Way by Cesar Milan, The Dog Whisperer. ar’s literary prowess, I’m choosing it because I believe that Cesar Milan understands dog psychology better than anyone and that he does a great job relaying that information through his books and TV show. Although I do not have any dogs at the moment we had a few dogs growing up. I come across dogs quite a bit in my life now so having the basic knowledge of how to deal with dogs, read their body language, and be calm and assertive has served me well since reading the book. The best browser: Chrome for Mac. I’ve been using a nightly build of Chromium for about 2 months now and I’m addicted. Even though the browser is severely crippled feature-wise due to its “beta” status (it is missing a bookmark manager, proper import/export, and has a few UI niggles on the Mac) I’m addicted to the speed. I haven’t seen any benchmarks to support my claim but on my Macbook Pro Chromium seems much faster than Safari. It shares some drawbacks with Firefox but so far speed is the winning feature of browsers. All that being said about Chrome on the Mac I could easily see one update from the Safari team getting me to switch back to Safari. No new features needed, just make it faster. Ok, the tabs on top is a nice touch too. I know, a celebrity Twitter account being the best? Keep in mind, this is my list, not yours. The main reason that I enjoy Jon Favreau’s Twitter stream is because it is really him. There are a number of celebrities that have people “managing” their Twitter accounts or they only use their Twitter accounts strictly for promotion of their projects. Favreau strikes a good mix of personal, business, and communication tweets. We should all aspire to do the same. The best email client: Mobile Gmail. Mobile Mail.app on the iPhone is an adequate and capable mail client. However, if you have a Webkit powered browser on your mobile device I suggest giving mobile Gmail a spin. In a pinch, it works remarkably well and is arguably the best email client on any mobile device. So, this is the best of 2009 as told by me. I’m sure I’ve left a few things out. But subscribe to my site or follow me on Twitter because I’m sure that I’ll be mentioning some great things throughout 2010 too. Thanks for reading, see you next year.